The Striped Raphael Catfish is very peaceful and thought to be the nicest of the Thorny Catfish! The Striped Raphael Catfish Platydoras armatulus has been a favorite of aquarium enthusiasts for a very long time. These are very pretty catfish with broad black and white stripes that run the length of their body. The pattern is especially striking when young, though as they mature the striping is not quite as strong. They also get pretty big as in the wild, generally growing to about 7.9 inches (20 cm) in length, yet in the aquarium they are usually closer to about 6 inches (15.25 cm). These are really fun fish to watch as they have a curious nature. They are nocturnal, but once they are comfortable in their environment they will often spend many daytime hours exploring the aquarium. They are very peaceful and hardy. An excellent choice for the beginning aquarist, or any catfish enthusiasts that wants to keep a moderately large community tank. This fish is a member of the Doradidae family, commonly known as Thorny Catfish. This is actually very appropriate as they are tough skinned catfish with a well-developed nuchal shield in front of the dorsal fin and bony lumps running along the lateral line that form thorny scutes. A curious fact about the Striped Raphael Catfish is that these bony lumps become tiny curved spines that offer great protection. This group is also called "talking catfish due to their ability to vocalize. They produces sounds, croaks, clicks, or squeaks, by rubbing their pectoral fins across grooves in the shoulder, which is amplified by the swim bladder. Thus this fish is commonly called the Striped Talking Catfish. Other common names it is known by are Humbug Catfish, Chocolate Catfish, Striped Dora, and Southern Striped Raphael Catfish. The Striped Raphael Catfish are very hardy and tolerant of most water conditions. Although they are naturally nocturnal, they have a typical feline curiosity, and once comfortable in their home they will often venture out to explore during the day. They like to burrow in the soft river bottom so be sure to provide a corner of fine gravel or sand. They also like some plant cover to help keep their tank dimly lit and hiding places like the hollows of roots or driftwood, clay flowerpots, or pieces of plastic piping. Plant are appreciated but not essential. These are very peaceful and a great catfish choice for a beginning aquarist. They do well in a community aquarium and make an excellent companion with most other medium to large fish, only very small fish may get snacked on. With its armored thorny protection it can even be kept with more aggressive tankmates. The Striped Raphael Catfish Platydoras armatulus was described by Valenciennes in 1840. They are found widespread distribution across South America. They occur in the Amazon basin in Peru, Bolivia and Brazil as well as a couple other river basins in Brazil; in the Rio Orinoco basin in Colombia and Venezuela; in the Rio Essequibo in Guyana; and in coastal drainages of Suriname and French Guiana. They are not listed on the UCN Red List of Endangered species. Other common names they are known by are Humbug catfish, Chocolate Catfish, Striped Talking Catfish, Striped Dora, and Southern Striped Raphael Catfish. For many years, until sorted out by Piorski et al in late 2008, the Striped Raphael Catfish was ms-identified as Platydoras costatus. But that species is the Rafael Catfish and it is not the commonly available species as it has a very limited distribution, found only in two rivers in eastern South America. The Striped Raphael Catfish on the other hand, has a very wide distribution across South America. It is found in both the Amazon and Orinoco basins and it is the species that has been collected for the hobby for decades. This is one of the "Rafael" catfish. Two other Rafael's are very similar striped species, but with each originating from different localities. These are the the Raphael catfish Platydoras costatus and the Longnose Rafael or Long Nosed Raphael Catfish Orinocodoras eigenmanni, which is differentiated by a slightly longer snout. Another very popular Rafael is the Spotted Raphael Catfish Agamyxis pectinifrons, which as its name implies, is spotted. It belongs to the Doradidae family, which are known as Thorny Catfish. These are tough skinned catfish with a well-developed nuchal shield in front of the dorsal fin and bony lumps, forming thorny scutes, along the lateral line. This family is also called "talking catfish" because they can produce audible sounds by rotating their pectoral spines in their sockets. The Doradidae family is by no means the only types of catfish that can make vocalizations, the Squeaker Catfish of the Mochokidae family are also noted as being very vocal. Some others Doradid's called "talking catfish" include the Spiny Catfish Acanthodoras spinosissimus. Unlike the Spotted Talking Catfish, it is not suitable for a community aquarium as it will eat smaller fish. 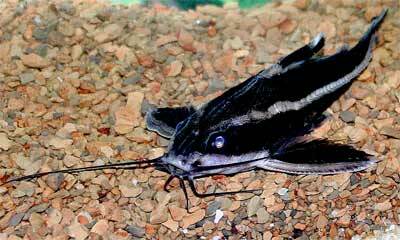 Another is the Painted Talking Catfish Acanthodoras cataphrectus. This is a very pretty with an almost paisley type design in its patterning, and it is also a very peaceful fish that does well in a community aquarium. The Striped Raphael Catfish inhabit the slow moving or standing waters of tributaries, creeks and swamps that provide shelter among roots or submerged vegetation. They feed on mollusks, crustaceans, and organic debris. They are normally found in soft sandy areas that also allow them to retreat under the substrate for protection. During the rainy season these fish will move to the food rich flooded forests. They are somewhat territorial, but will school for protection in the wild. It has been recorded that juveniles are known to clean piscivorous fish (those that feed on other fish) like the Wolf Fish or Tiger Fish Hoplias cf. malabaricus, removing parasites and dead scales. As juveniles they are similar to other types of cleaner fish, having a strong striped patterning. This pattern is thought to possibly be a signal that is recognized as indicating a cleaning service rather than as a food item. The striping fades as the fish mature, so it has been suggested that may be why the cleaning behavior has only been recorded with juveniles. Social Grouping: Groups - Thought somewhat territorial, they will school for protection in the wild. The Striped Raphael Catfish have a cylindrical, arrow-shaped body with a flattened belly. Females are more full bodied than males when seen from above. They will generally reach up to 7.9 inches (20 cm) in length in the wild, with an occasional specimen reportedly reaching up to 9 1/2 inches (24 cm). In the aquarium they will usually grow to about 6 inches. They have an average lifespan of up to about 20 years, and one specimen is said to have reached 22 years in captivity. The body color is a dark brown to black with conspicuous white lateral bands creating a striping pattern. The snout, lower part of the head, and the front edge of the pectoral fins are also white. As these catfish age the striping pattern is not as strong. These catfish have a big head with large eyes. The mouth is large and there are two pairs of maxillary barbels. They are on either side of the mouth, with one on the lower and one on the upper jaw. As with all in its genus, they are tough skinned catfish with a well-developed nuchal shield in front of the dorsal fin. Bony lumps form thorny scutes along the lateral line, which become tiny protective curved spines. They have a strong spines on their pectoral fins that can be extended out to the side in a very rigid manner, and the inner spines can be used to sting. These spines can easily become entangled in a net. Untangling them is stressful to the fish and a bit dangerous for the keeper, as a prick from these spines can be quite painful. They are called "talking catfish" because they have the ability to produce audible sounds by rubbing their pectoral fins across grooves in the shoulder. This sound is amplified by the swim bladder and sounds like croaks, clicks, or squeaks. The Striped Raphael is often confused and offered for sale with the Long Nosed Raphael Catfish Orinocodoras eigenmanni, due to their many similarities. They can be distinguished however, by the longer snout on the Long Nosed Raphael and its longer adipose fin. Though if you don't know the identity of your fish, it isn't a big deal as they both require the same care. Lifespan: 20 years - Their average lifespan is about 20 years, several are reported by hobbyists at 15 years old, and one at 22 years. The Striped Raphael Catfish is hardy and moderate in size, making it a great first catfish for the beginning aquarist. They do a great job cleaning the tank and not very picky about what they eat. These are bottom scavengers that do a great job cleaning the tank. Their water requirements are very easy to meet and their temperament is of a peaceful nature, making them good community fish. There is not usually much of a need to upgrade to a bigger tank as much as it is with some of the larger catfish, unless you want to increase the number of fish you're keeping. Thorny Catfish have a strong first spine on their pectoral fins, which can be used as a defensive weapon. They tend to stick out these side spines out in a very rigid manner, especially when stressed. It is best to catch the Striped Raphael Catfish with a glass container or plastic bag. The spines can easily get caught in a net and it can be difficult to try and get them untangled, and it is also a bit dangerous. A prick from the spines of this fish is quite painful! The Striped Raphael Catfish are omnivores and not fussy terms of feeding. In the wild they will feed on a mollusks, crustaceans, and organic debris. They are bottom feeders and In the aquarium they will eat any food that reaches them. Feed them daily, and since they are nocturnal the best time to feed these fish is after the tank light is turned off with a night light in the room. One thing to be careful of is overfeeding. It has been reported that they will actually eat themselves to death if given too much food. Protein foods are most important for them, though they will graze on some algae. To keep a good balance give them high quality sinking pellets everyday, along with freeze-dried bloodworms and tubifex. They will eat live foods such as bloodworms, earthworms, and tubifex. They are bottom feeders and may also eat frozen foods as well as flakes that have sunk to the bottom. Diet Type: Omnivore - They do eat some organic debris in the wild, but protein is the main staple of their diet. Feeding Frequency: Daily - This fish is nocturnal and prefers to be fed right before or after lights out in the aquarium. These are hardy fish that tolerate most water conditions. There really isn't much that needs to be done for the easy going catfish. They are very low maintenance and their tank only requires water changes of 30% a month. This is one of the catfish that have sharp spines not only on the dorsal fins but on the pectoral fin as well. It is better to capture them in a glass or plastic container for transport. Water Changes: Monthly - These low maintenance fish only require water changes of 30% a month. The Striped Raphael Catfish are moderate in size but not overly active, so a 30 gallon aquarium or larger will suit them fine. Although they tend to be nocturnal, getting most active in the evening and nighttime when they come out to scavenge for food, they are also quite curious. Once they are comfortable in their home, they will often come out during the day to explore. As with most catfish they enjoy well oxygenated waters and this can be accomplished using an undergravel filter and a powerhead. They prefer slightly softer water but it is not essential. Provide a dimly lit setup with hiding places. The hollows of roots or driftwood, clay flowerpots, or pieces of plastic piping work well as places of refuge. They also like to burrow in the soft river bottom so be sure to provide an open corner with fine gravel or sand. They will not harm plants and will appreciate some in floating cover as well, to help reduce the light. They will graze on algae though, and some of the smaller leaved plants may get a silty dusting when this catfish burrows into the sand. In the evening as it starts to gets dark, they will come out to scavenge along the bottom of the tank for tasty morsels. If you want to observe this fish at night, try adding a red light or some Moonlight LED's to the tank and enjoy it foraging for food. Minimum Tank Size: 30 gal (114 L) - A 30 gallon tank is minimum as this fish is not overly active, though more room is better when keeping it with a larger community. Substrate Type: Sand - Sand or Sand/Gravel mix that the fish can burrow in. The Striped Raphael Catfish are peaceful bottom scavengers. 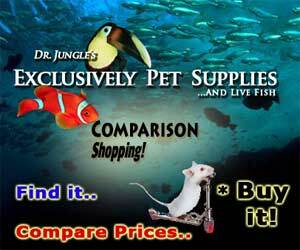 They are a good community fish and are very friendly with other medium to large fish. They have the reputation of being the nicest of the Thorny Catfish species and get along well with most other tankmates, but avoid fish that are so small they could be considered food. With its armored thorny protection it can usually be kept with more aggressive tankmates too. South and Central American cichlids, larger tetras and other characins, cyprinids, gouramis and other anabantoids, livebearers, and other non-territorial catfish all make good companions. They can be kept singly or in a group. When kept with their own kind they are somewhat territorial, so there may be some scuffling, but no damage is caused and they will then often share the same hideout. In the wild they will school together at times for protection. Venomous: No - Although not venomous, the Striped Raphael Catfish is armed with a set of spines sharp enough to do damage to the aquarists hand. Same species - conspecifics: Yes - They are somewhat territorial and may tussle on occasion when kept in a group, but no damage is done. Peaceful fish (): Safe - The Striped Raphael will eat fish small enough to fit in its mouth. Semi-Aggressive (): Monitor - Can usually be kept with semi-aggressive and aggressive fish such as cichlids. Shrimps, Crabs, Snails: Threat - is aggressive - In the wild, this fish hunts at night for mollusks and crustaceans. Mature females tend to be plumper then males when seen from above. The Striped Raphael Catfish has rarely been bred in captivity. These are spawning fish that so far are only bred commercial using hormone injections. Some spawning success has happened in the aquarium, as fry have been found, but it is accidental. A few successful breedings have also been reported in very large tanks however this is not easily accomplished and there is little information is available. In the wild this spawning species releases its eggs into the rivers and streams to be fertilized. It has been reported that other species of small Doradidae could be called nest builders. In the tank they may gather up general debris or find an area with old leaf litter and tidbits of wood, and try to hide beneath it. Then other fish of the same species will tend to swim around this "nest." But whether they had a successful spawn has not been reported. For information on the breeding of catfish in the aquarium, see: Breeding Freshwater Fish: Catfish. The Striped Raphael Catfish are fairly hardy but are subject to the same diseases as other tropical fish. Disease is not usually a problem in a well maintained aquarium and these catfish are very resilient. The most common problem that happens to this fish are injuries from netting and transportation. Take great caution when catching and removing this fish. High nitrate levels can also cause these catfish to develop infected barbels; this makes it difficult for them to navigate and eat normally. Maintain nitrate levels below 20 ppm through regular water changes. Because they are a scaleless fish, catfish can be treated with pimafix or melafix but should not be treated with potassium permanganate or copper based medications. Malachite green or formalin can be used at one half to one fourth the recommended dosage. Take care when treating disease as the Synodontis Ocellifer is extremely sensitive to medications. The best way to proactively prevent disease is to give your fish the proper environment and give them a well balanced diet. The closer to their natural habitat the less stress the fish will have, making them healthier and happy. A stressed fish will is more likely to acquire disease. Anything you add to your tank can bring disease to your tank. Not only other fish but plants, substrate, and decorations can harbor bacteria. Properly clean or quarantine anything that you add to an established tank so not to add new diseases to the tank. For information about fish diseases and illnesses, see Aquarium Fish Diseases and Treatments. The Spotted Raphael Catfish is readily available at pet stores and online, and is reasonable in price. It may also be called the also called the Humbug catfish, Chocolate Catfish, Striped Talking Catfish, or Striped Dora. I found this website and enjoyed your information on the Striped Raphael Catfish so I thought I would submit a comment. I no longer have a receipt of purchase but a long-ago boyfriend found 2 of these cute bottom feeders at a pet store and brought them home for my tank. The smaller one lived 15 years and at some point I changed my 29-gallon (long) tank to a 10-gallon one to accommodate two remaining fish until their end. The store is long gone, as is the boyfriend. Family members have since passed and I have moved (with my catfish) several times. A long-time buddy remembers visiting my tank years ago. Every so often, she and other acquaintances ask me, 'Do you still have THAT fish?' Yes, I do; just the one. 41 years later, 'Catnafish' and I continue to get together for regular aquarium water changes as I wonder, at age 66, who will live longer? Just wanted to share this with you and your readers. I bought my catfish in 1993 and he/She is still with me. 25 and going strong. In fact , I had to reduce the size of the tank to keep him with me when I moved to Mexico and Now that are more active and interactive. Change the water and filter every two weeks. My son and I just bought a striped and a spotted Raphael catfish...but the striped one is curled up like a ball?!? I have seen him swim a little...he does lay upside down but this being curled up and his fins are not fanned out...they are ...like closed :( I am really worried about both of these fish! People say they are very hardy but they both look VERY sick or sad or something! Our tiger barbs look great! Our water is a little cloudy...but just did a 40% water change. Can they be upset/stressed because they don't have a cave or something to hide in? Will this kill them? They have been like this for about 2 days. Any help will certainly be appreciated!!! I would give a hiding spot soon and more one. I would also take a picture of the fish and someone a the petstore.